When we think about 9/11, we honor those who risked their lives, we watch the 9/11 video footage of the World Trade Center collapse, and we remember President Bush’s public address. The critically-acclaimed video The Third Jihad is available to watch free online this September 11th – watch now to learn about the threat of Radical Islam in America. By watching The Third Jihad video this 9/11, you will be paying tribute to those killed in the September 11th attacks. We must remember what happened on 9/11, and honor the heroes of Flight 93 and the victims of the 9/11 Pentagon and World Trade Center attack. On 9/11, Bush said that the Radical Islamic 9/11 terrorists “have failed. Our country is strong.” Watch The Third Jihad video this 9/11 to understand the forces which combat the American strength in the years following the 9/11 World Trade Center attacks. Share the 9/11 video -stream with others and educate them about the threat we face. This September 11th, pay tribute to the memories of the 9/11 victims, educate yourself, and awaken others. Our country must remain strong. 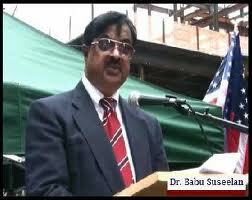 Dr Babu Suseelan is an eminent Psychiatrist and a De-Addiction therapist in America. Besides that he is a much sough after iconic Indian spokesperson sought by Right Wing Political parties, Human Rights Forums and the Intelligence Agencies for Counter- Terrorism advice. This is something I always suspect and was telling- and no news for informed Hindus. That the Secular crowds in Hindus are so many Programmed Zombies and psychopaths. Here is what Dr Babu Suseelan writes to me- that they need a Psycho Therapeutic De- Tox ! Yes, many Indian middle class Hindus are deeply immersed in making money, promoting selfish interests and following elitists, phony harmful secularism. Several NRI Hindus are aware of India’s problems, needs and what ought to be done to get out such a predicament. NRI Hindus are clearly aware of the problem from a distance. It is difficult for NRI Hindus to be in India and lead a social revolution to wipe out corruption, religious conversion, border disorder, Islamic infiltration and public looting. But we can write, send words to our friends and show the right way. Certainly our words have an impact and meaning. Pseudo secular, apathetic Hindus who are in deep denial have to be told and retold in stronger terms to wake them up to face reality. These psycho-programmed Zombies need a hard knock to make them realize that they need to solve these life threatening problems or they will soon wiped out. These zombies are addicted to dangerous and phony secularism and slavery. Unless they are willing to acknowledge their addiction and become real, recovery will be slow and difficult. The only answer is to mobilise and focus public opinion on one line aim to replace fake secularism and Gandhian worship with secularism of Hindutva and drive Congress out of power through political unification of Hindu votes. People shall have to be motivated orally, through writings and every possible means of communication. We are Hindus first and anything else later. The concept of European type nationality has stemmed out of colonisation and imperialism. People get grouped according to the way of life they live in a particular geographical area while remaining committed to preserve local natural environment of their area and follow live and let live concept. Public and particularly Hindus have been brainwashed by Congress propaganda to understand the realities. Their minds shall have to disinfected through facts and figures. Hindus need not remain apologetic but must assert their rights in India as the owners of India. India is neither a no man’s land nor for aggressors and deceitful infiltrators.